Seems like that was a close one there with Eadfrith in Dr Cotchery’s manor. Eh, it’s probably nothing… down in that basement. They needed to get to Father Mayhew anyway. So off they go through Esker with a spring in their step and hope in their hearts! Or was the spring in their hearts? I don’t know, who’s to say? Any damn way, what was up with that beetle? As always you can head on over to Schwalbentertainment.com for a look at all the Demon Lord action! Music in the episode is from Battlebards.com . Torel, Four, and Eva are still kicking and pressing on. Thanks for joining us as they discover a little more about what is happening in Esker, and what it might mean! With the threat presumably under control, Torel, Four and Eva begin to look for a place to regroup. OH they find one… I wonder how safe it is? It’s probably fine… For now anyway. Mysterious visitors, somewhat of a reveal, lets see what they get up to in this episode. Thanks for taking a listen and we hope you are enjoying the tale so far! Episode 5: Welcome to Esker!! We’ve made it to Esker! Yikes! I’m sure Eva, Torel and Four are just happy to be out of Brildar.. especially Eva. The knew they’d be heading into some sort of fight, but are perhaps taken aback by the scene they come upon. We hope you enjoy this weeks episode and thanks for checking us out! Author MichaelPosted on April 6, 2018 Categories Actual Play PodcastTags Actual Play, AP Podcast, Podcast, Robert Schwalb, RPG, RPGs, Schwalb Entertainment, Shadow of the Demon Lord, SotDL2 Comments on Episode 5: Welcome to Esker!! Having seemingly ending the threat at the Farm by sealing the Void breach and sending the demons back to the Void, Four, Torel, and Eva head back into town to begin preparations to join the fight against another strange threat in Esker. But first, there’s the little matter of Eva’s Grandmothers unexpected visit for Eva to deal with…. Thanks for listening and we hope you enjoy this weeks episode! Welcome back! Wow. We had some wonderful feedback and reviews. We truly hope we can keep this train rolling for you and we are so happy you’re enjoying the game so far. We continue now with Four galloping off toward Jahrod’s farmhouse with Christopher, Jahrod’s farm hand, along for the ride. Eva returns home to find something interesting at her loom, and Torel discovers something in the documents that may change everything for him! Enjoy! And check out the Blood and Steel Podcast. They’ve recently delved character creation starting with the Ancestries from the core book that you can choose from. Episode 1: Welcome to Brildar! Alright… so it’s NOT Valentines Day… I know. It was a completely foreseen circumstance, too. Oh, well. We’ll just bump everything up a week and get this party started early! Anyway, thanks for checking us out, I hope you enjoy our first episode where we are introduced to Eva, Torel, and Four. The players have come up with some great characters here and I personally can’t wait to see where we go from here. ENJOY! 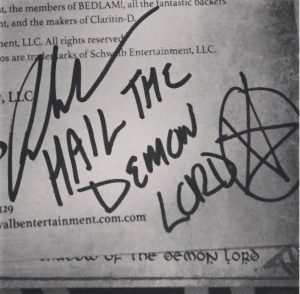 Head on over to Schwalbentertainment.com for a look at all the Demon Lord action! And check out the Blood and Steel Podcast. They discuss all things Shadow of the Demon Lord and, man… what a coincidence on the naming, huh? They are doing a fantastic job so far and will be diving into different aspects of the rules and setting! Author MichaelPosted on February 9, 2018 Categories Actual Play PodcastTags Actual Play, AP Podcast, Podcast, Robert Schwalb, RPG, RPGs, Shadow of the Demon Lord, SotDL1 Comment on Episode 1: Welcome to Brildar! NOTE: This podcast has the explicit tag and may contain mature language, situations and violence and graphic descriptions. Listener discretion is advised. Tales of Blood and Stone is an actual-play Shadow of the Demon Lord podcast run by a bunch of cool nerds. But then again, all nerds are cool.